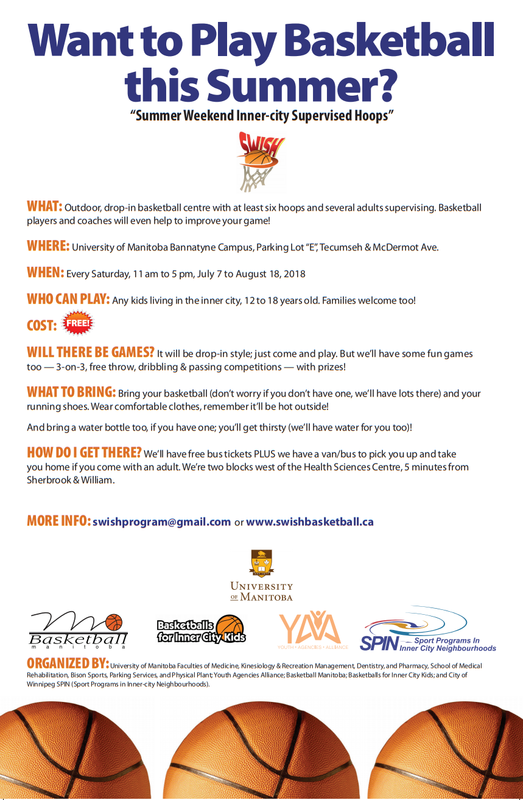 Through a partnership between several faculties/units of the University of Manitoba and community partners, a free outdoor drop-in basketball program will be taking place this summer at the U of M Bannatyne Campus. 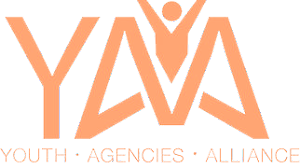 Project SWISH will provide an opportunity for inner city kids to play basketball, under the supervision of paid staff and volunteers, including adult basketball players, coaches, and community members. SWISH will run Saturdays from 11am to 5pm, from July 6 to August 17, 2019. On the large staff parking lot at the UM Bannatyne Campus, McDermot & Tecumseh. Children, aged 12 to 18, and their families, residing in the inner city are welcome to participate. 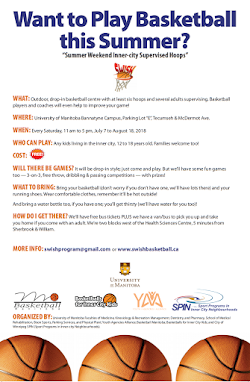 There's no cost, and no pre-registration, just bring a basketball and have some fun! At least a half dozen portable hoops will be set up, with the possibility of more being added later. Free transportation will be available, including free bus tickets as well as bus/van rides for children who are accompanied by adults. Throughout the summer, different activities will take place at the site, including 3-on-3, free throw, dribbling, and other fun games with prizes! Best of all, it'll be a place for inner-city kids to drop in anytime with their basketballs and shoot some hoops! City of Winnipeg SPIN (Sport Programs in Inner City Neighbourhoods).